Has Livestreaming Changed The Social Media World? The answer is a resounding YES! Livestreaming has absolutely changed the social media landscape for brands as well as small business and individual broadcasters. Livestreaming (live broadcasting) has been around for years, (remember Ustream?) but it has gotten miles of traction, loads of press and many tens of thousands of participants within the past year; particularly since March 26, 2015 when Periscope came on the scene. Meerkat, the first Livestreaming app to appear in 2015, was actually launched three weeks prior to Periscope, but Periscope was very quickly acquired by Twitter…then Facebook Live was launched, and for now, the rest is history. 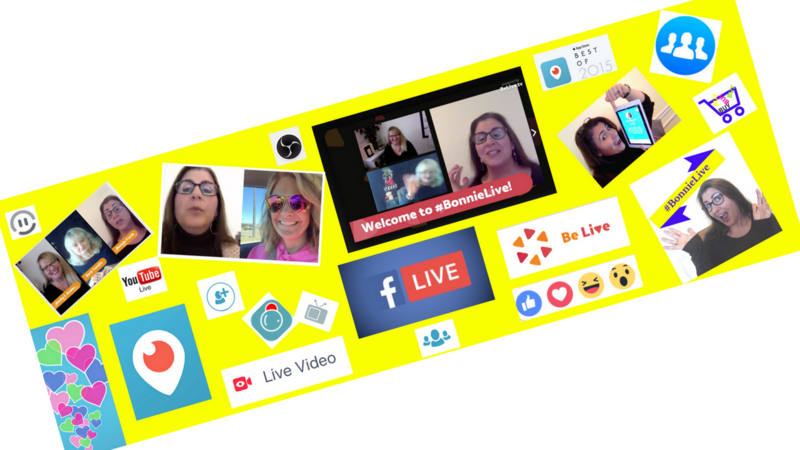 Regardless of the livestreaming platform you use and how often you use it, live broadcasting appears to be here to stay; in fact, my business was built on Periscope and at one time 100% of my clients came from seeing my Periscope broadcasts. So what exactly IS livestreaming and how can you up YOUR social media game with it? Livestreaming is the ability to broadcast live and you don’t need any fancy equipment (although there are lots of tools you can purchase to enhance your broadcasts!) to do it. I produce 25-30 livestream broadcasts each week with my iPhone, iPad, laptop and the earbuds that came free when I purchased these. I broadcast on Periscope, Facebook Live, and BeLive.tv and only talk about four topics: business, social media, marketing and livestreaming. I chose these topics because I was already blogging about them. It just made sense. Besides broadcasting about the latest changes in social media (which includes livestreaming), I also provide a variety of tutorials, Q and A sessions and reviews. Everything around me is a possible broadcast topic and I bring it all back to business. The fact that Periscope is owned by Twitter (and that you can easily tweet out your live broadcasts directly from the platforms themselves) has been a HUGE game changer for Twitter and for ALL livestreamers; in fact, my most recent stats showed that I had over 110, 000 Twitter impressions within the past 28 days. What does this mean in terms of my bottom line? Can I really make money from this live broadcasting stuff? I can happily say that livestreaming has literally transformed my business; in fact, in the first two months of 2016 I doubled my 2015 revenue. Livestreaming can easily be used to position yourself as an expert in your field and these platforms highlight your expertise to an entirely new audience. I’ve used livestreaming for lead generation, to promote all of my products and programs and to engage with influencers. Although many do not, I often sell directly from the platforms. What should you do if you’re interested in livestreaming? How should you begin? I always advise my clients that they should try any new social media platform for at least ten consecutive days before deciding that they don’t like it and/or that it is not right for their business at that time. This means that, if you’re interested in trying Periscope, you should produce at least one Periscope broadcast for ten days in a row before determining whether or not to continue with it. I would suggest that you follow me on Periscope or Facebook Live for tips and tricks, as well. Although there are lots of courses and guides to help you with the ins and outs of livestreaming, to find out where and how to begin, I would choose one platform to investigate and then research it with the classic two: Google and YouTube. I’m happy to help you at any time! Please feel free to DM me on Twitter with any livestreaming questions or problems.